Habitat for Humanity New Zealand participation was acknowledgement of their work in the Pacific – most notably in Tonga, Samoa and Fiji. This opportunity placed Pacific housing issues on the global stage. It also drew attention to Habitat for Humanity’s innovative responses to housing need for those on lower incomes, particularly regarding the effects of climate change. Despite the New Zealand government not sending representatives to this event, nor the Habitat III conference last year, Habitat considers this an important initiative to be involved with. The New Urban Agenda ensures that issues of adequate and affordable housing are given priority within the Sustainable Development Goals. 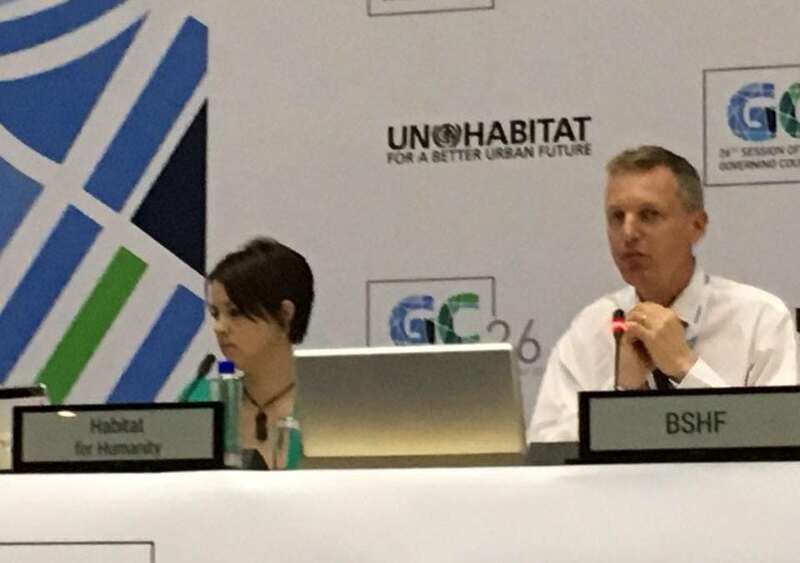 Global discussions of best practice urban planning and programs for inclusive, sustainable cities play a significant role in ensuring that everyone has a decent place to live – both in New Zealand and overseas. Below is the address given by Claire at the high-level panel discussion session. Malo e le lei, Talofa lava, Ni San Bula Vinaka, Kia orana, Tena Koutou katoa, South Pacific Greetings. My name is Claire Szabo, CEO of Habitat for Humanity New Zealand, and I speak today on behalf of the Habitat for Humanity global network. May I express my thanks to the people of Kenya for their hospitality hosting this event. 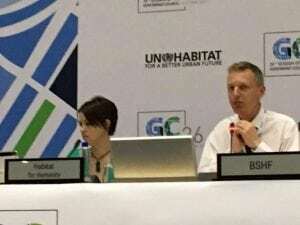 Habitat for Humanity welcomes the chance to speak at UN-Habitat’s 26th Governing Council meeting in this high-level dialogue session addressing Housing at the Centre of the implementation of the New Urban Agenda. Many of you will know our non-government organisation for its practical work over the last four decades building simple, decent homes in more than 70 of your countries. In the lead up to last year’s Habitat III meetings in Quito, we worked representing Civil Society Organisations within the General Assembly of Partners and in the World Urban Campaign, we worked with National delegations, and the Global Land Tool Network, for a systemic focus on housing, community participation and land tenure access, especially for the world’s poor. We are pleased with the final outcome document, the New Urban Agenda, and salute its recognition of decent housing, not only to achieve an adequate standard of living for households, but as an integrated platform improving our cities. The New Urban Agenda however, will only be as good as its implementation. Recognising principles that are both universal and essential for cities, we are introducing our new urban approachto promote sustainable cities, tailored to each local context, working with households and local partners. Secondly, Habitat for Humanity has launched a global advocacy campaign called Solid Ground, to improve awareness and systems to help 10 million more people secure access to land for shelter by 2020. Thirdly, noting the role that markets play in housing, Habitat for Humanity has established the Terwilliger Centre for Innovation in Shelter. The centre will facilitate better-functioning, more inclusive markets enabling 8 million more people to access improved shelter by 2020. Finally, through a wide array of approaches, partnerships and knowledge sharing initiatives, Habitat for Humanity will improve housing affordability and access for nearly 40 million people by 2020, and for 200 million people by 2036. These commitments reflect not only the increasingly complex, intersecting challenges faced the world over, but also respond to the need for new partnerships, as recognised in Sustainable Development Goal 17. A case from my region of the world, in the small island developing state of the Kingdom of Tonga, contextualises the concept. Inhabiting a far-flung South Pacific archipelago, facing frequent tropical cyclones and sea surges, and with a building supply market characterised by high costs and unreliable quality, the Tongan people have much to teach the world about resilience and human potential. In 2016, facilitated by Jenny Salesa, a New Zealand Parliamentarian of Tongan descent, Habitat for Humanity established partnerships with the Deputy Prime Minister of Tonga, and with in-country development agency Caritas Tonga. We have now collectively designed and piloted a new approach to housing development in the Kingdom. For their part, the Tongan Government has supported its Development Bank to make small loans with favourable conditions available to low-income Tongan families in disaster prone areas. We drew on existing relationships with volunteer builders and with market suppliers to purchase quality, affordable building components in New Zealand, nearly halving the cost of the loan needed by participating Tongan households. The solution increases disaster resilience, and is affordable, sustainable, and targeted at the poor. Its governance is collaborative across government and non-government. Its operation bridges countries, includes the private sector and volunteers, and recognises households as partners and participants. As we all play our part in the New Urban agenda, we must build new competencies; to create people, private, public, partnerships bridging the whole housing ecosystem, to sustain community participation and ownership, and to form unexpected and game-changing alliances. It is only through this new era of competent collaboration, that we stand any chance of addressing the challenges staring down the twenty-first century and to achieve integration in our policy frameworks, and inclusion in our outcomes. Habitat for Humanity, currently entering its fifth decade and working in 70 countries around the world, has borne witness hundreds of thousands of times as households increased their dignity and prospects, through access to adequate and affordable housing. Cities and nations are powered by the energies of human development and endeavour only possible with decent shelter. We now turn to progressing, monitoring, reporting on, and meeting our outcomes commitments. We look forward to effective, accountable implementation of the New Urban Agenda. And we seek to partner with governments, Civil Society Organisations, markets, and households, to build a new urbanised world, with people at the centre, where everyone has a decent place to live. For what is the most important thing in the world? It is people, it is people, it is people. United Nations Human Settlements Programme (UN-Habitat) is an organ of the United Nations responsible for socially and environmentally sustainable towns and cities. Habitat for Humanity International has a formal relationship with UN-Habitat, working to increase access to land and security of tenure, as well as providing adequate housing and basic services in densely urbanized environments. The two organisations also work closely together in disaster response and risk reduction. 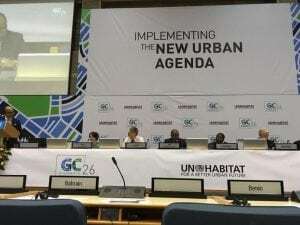 The New Urban Agenda is an urbanization action blueprint for UN-Habitat as well as governments, the UN, civil society, communities, the private sector, professionals, the scientific and academic community, supporting the 2030 Agenda on Sustainable Development. In particular it relates to SDG 11 – making cities inclusive, safe, resilient and sustainable.